100 years old in 1952 and now part of the CSX RR. Visit the Western Maryland Scenic Railroad in Cumberland, MD, you will not regret it. Individual marks are licensed marks owned by CSX Railroad Company and are used under an active license agreement. 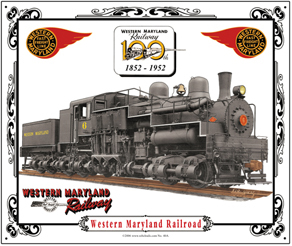 Western Maryland Railroads Shay #6 was the last and largest Shay produced. She is restored and operational at CASS Scenic Railway. Coffee Mug featuring the Western Maryland GP30 diesel in circus paint scheme. Beautiful coffee mug featuring Western Maryland Railroads Shay No. 6, with part of an original advertisement on the reverse side. No. 6 is alive and well at CASS Scenic Railroad. Western Maryland license plate featuring famous Fireball logo. 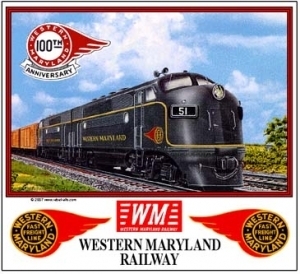 WM operates today at the Western Maryland Scenic Railroad. 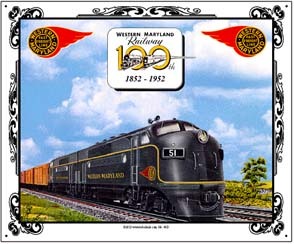 This mouse pad features the as delivered F-3 diesels of the Western Maryland Railroad. She was 100 years old in 1952. Classic Shay No. 6, the last and largest Shay manufactured worked in the coal fields of West Virginia. Logos and 100th Anniversary Logo included. 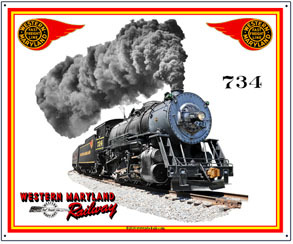 10in x 12in metal sign with images of the beautiful Western Maryland Scenic Railroads #734 steam locomotive. 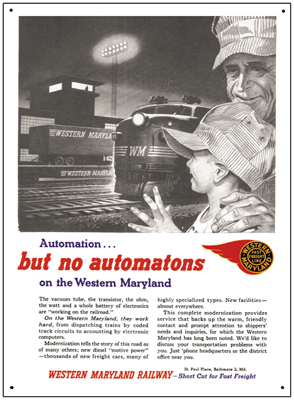 Reproduction of an advertisement ran by the Western Maryland Railroad promoting its automation after WWII. 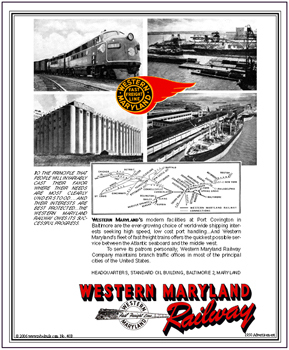 Sign of an advertisement used by the Western Maryland Railroad to promote its dock services and advantages. Unique tin sign of an as delivered F-Unit diesel in stealth black. Sign with image of the largest and last Shay produced. Shay No. 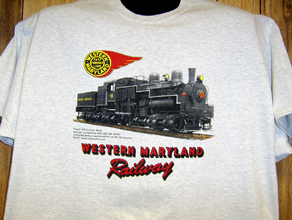 6 was ordered by the Western Maryland RR. She can now be seen in operation at CASS Scenic Railroad. 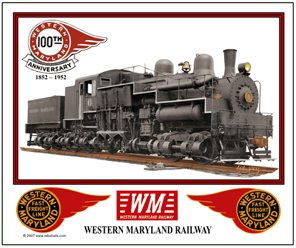 6 inch x 6 inch square tin logo sign of the Western Maryland Railroad, along with their 100th Anniversary logo used in 1952. 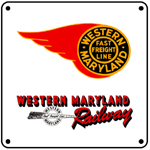 6 inch x 6 inch square tin logo sign of script and logos used by the Western Maryland Railroad in the 1950s.